NASA recently launched their Optical Communications and Sensor Demonstration (OCSD) CubeSat and successfully received communication that it is now in orbit. This is the first step in transmitting broadband through space. Although it won’t be a replacement to NASA’s current communication networks, the CubeSat network has the potential to bring speeds of up to 200Mbps and open up fast transfers between Earth and space. 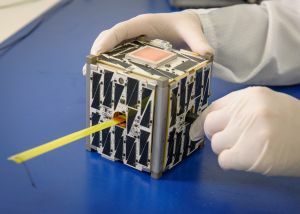 While NASA has tested other broadband satellite communications before, what sets the CubeSat network apart is that it provides faster speeds in a smaller package. These miniaturized satellites typically have a 1 liter volume and a mass of no more than 1.33 kilograms. This technology makes CubeSats incredibly versatile and can used from deep-space communication to satellite alignment. NASA will continue to launch more CubeSats over the atmosphere as they test their ability to send and receive information between Earth and their network of CubeSats.